A park at the centre of town is thronged with travellers as 30 separate caravans rolled into the site on the night of 26th June. Dozens of cars and caravans moved in on the field in Radnor Park, Folkestone, even crushing the flower beds as they mounted the pavement but by this morning, there were only 12 caravans left around the park where there is ongoing development work. Compared to the previous night, the site was a much more sight by morning. It has been years since council-owned land in the town has seen an occupancy as large as this one even though other sites in Shorncliffe Heights a few weeks ago also saw a sudden invasion of a smaller group of travellers. In May, approximately nine caravans landed on Taylor Wimpey’s land before moving to Cheriton Park after being served with an eviction order. It’s not known whether the recently seen caravans are part of the same group. It’s said that the caravans’ occupants were paid a visit by the police in the public park last night. There have also been reports that the hedges that surround the Folkestone Parks Bowls Club which is just behind Radnor Park and also opposite Royal Victoria Hospital had been turned into ‘hanging lines’ for clean washing. 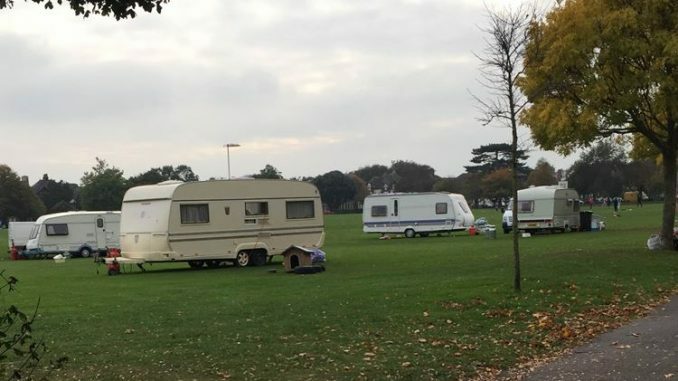 The police were alerted to the travellers’ presence in Radnor Park at around half past seven in the evening according to a spokesman for the police who also said that it was the local council’s responsibility to evict them.